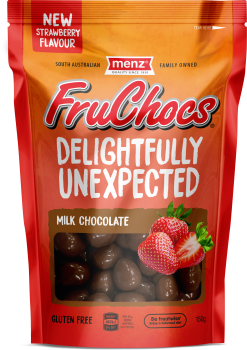 Australian confectionery business Robern Menz welcomes two new products to its iconic Menz FruChocs range with the inclusion of Vegan Dark Chocolate FruChocs and Strawberry Flavoured FruChocs. With the demand for Vegan friendly products in Australia ever growing, Menz FruChocs gives those following a plant-based diet the opportunity to enjoy the iconic confectionery brand in a convenient 150g pack at the same price as original FruChocs. Smooth dark chocolate coats the real apricot and peach centre to deliver a flavourful vegan friendly treat. 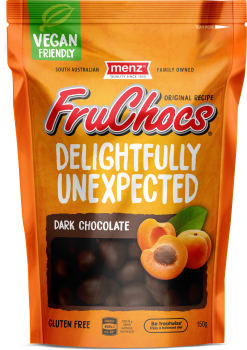 Menz Strawberry Flavoured FruChocs provide a twist on the classic apricot and peach blend, synonymous with the FruChocs brand. Each tasty morsel is infused with natural strawberry flavour and smothered with creamy milk chocolate for a zesty berry hit.